Four days, forty miles, ten thousand feet elevation gain. This post originally from a trip report I wrote. 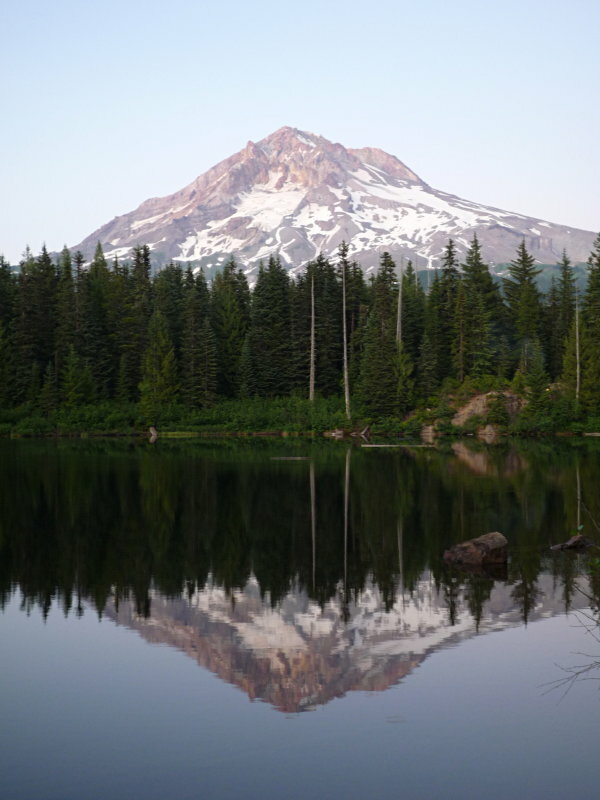 Burnt Lake is an idealic mountain lake with fish jumping, birds swooping and the reflection of Mt. Hood. Yocum Ridge has great views and nice solitude. Paradise Park does actually feel like a paradise when you get a chance to sit and relax. Unplanned, but fortunately escaped the 100F weather for a couple days. Ramona Falls on a hot weekday is empty. Lost Creek Campground provides a nice pit stop to unload trash and use a clean outhouse. Nearly full moon to sit under. West Zigzag is a rough climb with little reward compared to the other trails taken on this trip. Black biting fly swarms were exceptionally bad this time around. I need to write a letter to JetBoil about their crappy lid which has badly warped. Ramona Falls to Paradise Park on a very hot day is not fun at all. Nearly full moon took away all the stars. Right off the bat we started climbing from 1500' to 4100' in 3.6 miles. That really set the tone for the rest of the trip as it took a lot out of us while we were carrying our full packs. 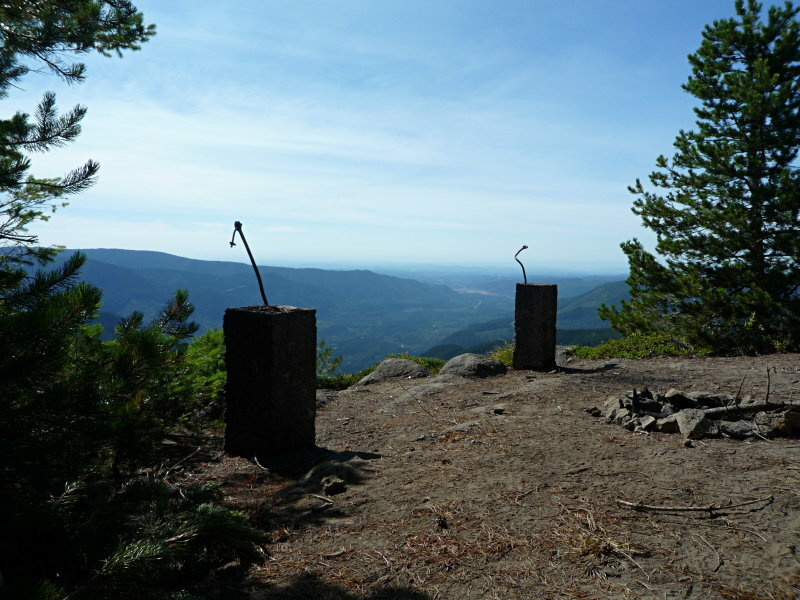 The lookout point was a nice place to eat but I don't think I will do West Zigzag again. We left a little later than I had hoped so we had to skip out on Cast Lake but opted to go up East Zigzag instead of going around. 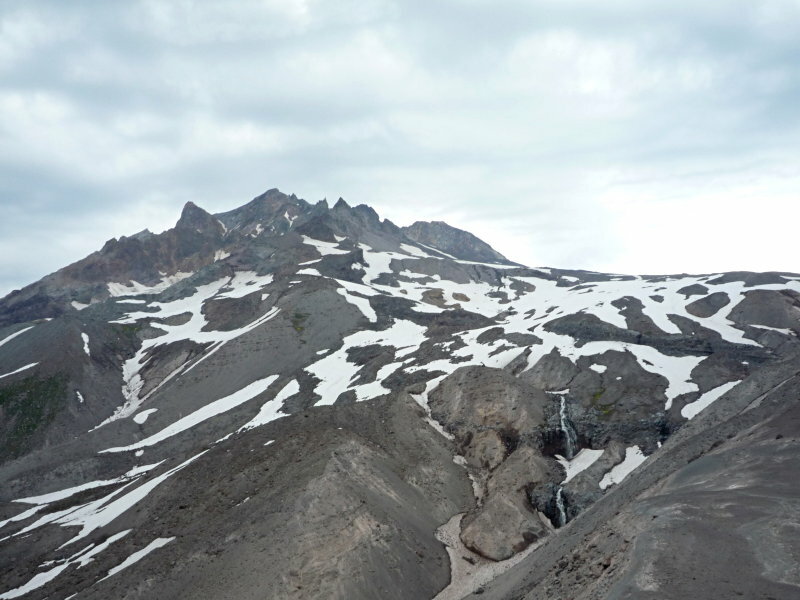 The top of East Zigzag is a cool place to relax with a good view of Mt. Hood. We got into Burnt Lake around sunset and found a campsite before it got really dark. 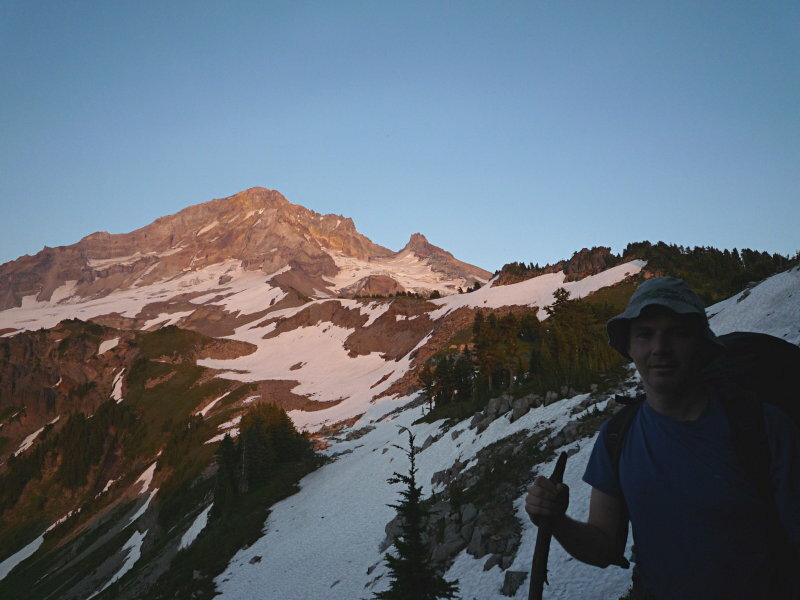 There were still patches of snow here at 4000' which surprised us but it was still a nice warm night. Mark took a quick dip in the lake. We lugged up a couple ears of corn and some potatoes to boil and had an awesome freakin' dinner. Nothing special from Burnt Lake to Ramona Falls as we have to go through the Lost Creek Campground. As I noted earlier, it's a nice pit stop to just get rid of any trash. This was a Friday and Ramona Falls was basically empty; I'm guessing the hot weather drove people out to the coast instead. One thing to watch out for is that a large tree fell on top of the marker for the Yocum Ridge / Timberline Trail fork. Furthermore the Yocum Ridge trail had a couple down trees that slightly obscured the trail. We missed it but realized our mistake 20 minutes later. The trail up Yocum Ridge has a lot of down trees and sometimes it felt like we were doing the gauntlet from American Gladiators. In general the hike up Yocum Ridge gets pretty cool the further you go up. We didn't meet anyone until the next day coming down. Short sections of the trail are still obscured by snow. Note that there were posts warning the Muddy Fork crossing was dangerous. We ran into a pair of hikers who got to it and decided they should go up Yocum Ridge instead. Another pair of hikers we met later on said they took an hour to do the crossing so that they could continue on to Bald Mountain. Day 3: Yocum Ridge -> Ramona Falls -> Paradise Park The Sandy River crossing wasn't bad at all but it was moving pretty swiftly. A lot of dust was being kicked up by the river too. The heatwave that hit Oregon also finally caught up to us and was beating down our necks the whole way. We had filled up on water at Ramona Falls but by the time we got to Paradise Park we were out. There are some decent viewpoints along the way but due to the heat we just kept moving past them. Even worse is that the flies were really awful. Anytime we took a break to drink water a swarm would form and bite the heck out of us. The end of the day was much better when the flies went away. The sunset over the city lights to the west was beautiful. Plenty of wildflowers still in bloom at Paradise Park and we only saw one pair of campers on the west side of the area. That night was pretty crazy. We weren't using our rainfly and that night a couple drops woke both Mark and I up. We got up to put the rainfly on and then noticed the lightning storm happening over P-town. We were a pretty exposed where we were at so as a precaution we moved our camp lower to a group of trees. Then we walked out a little bit and watched the show for a while. Day 4: Paradise Park -> Timberline Lodge We went up the hill from Paradise Park without our packs to get closer to Mount Hood. Definitely a side trail worth taking. Not only is the view gorgeous but all the flies go away. We left camp pretty late since it wasn't that far to Timberline Lodge and my sister was picking us up in the late afternoon to shuttle us back to Zigzag. Plenty of day hikers coming in and out later on in the day. The crossing at Zigzag canyon isn't a problem tho we didn't feel like switching to sandals so opted to walk up river a little bit to find the easiest point. 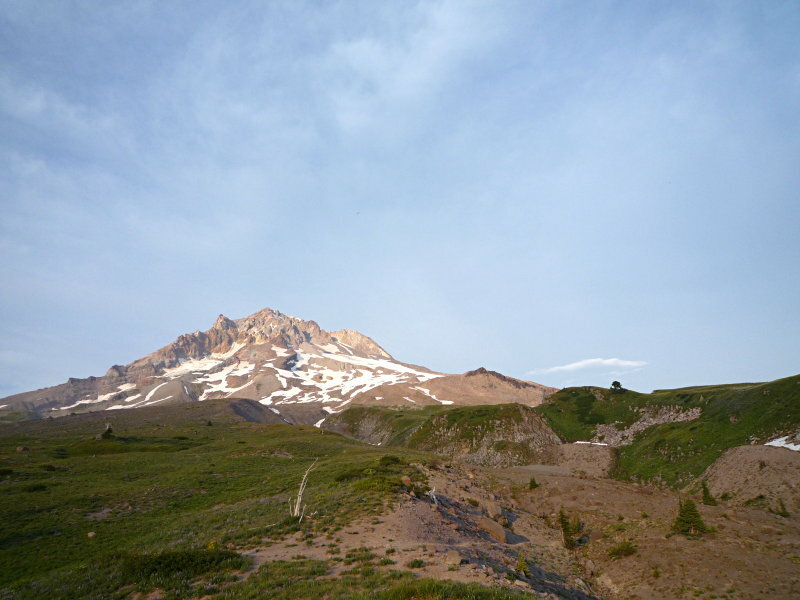 We also took the south Silcox Hut trail back to Timberline Lodge.